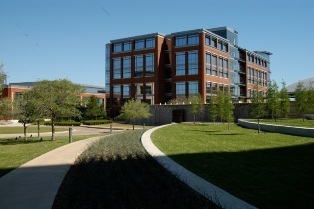 Hundreds of trees were planted on the original Radio Shack site Fort Worth. None were staked and none blew over. Trees that are planted properly rarely need to be staked. 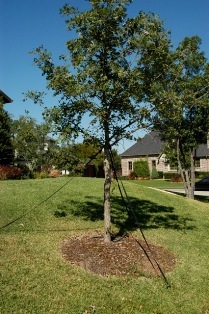 The ill-advised technique of staking trees was probably started years ago by those who planted bare-rooted trees and mistakenly put soft potting soil in the hole as backfill. Staking is a waste of money and detrimental to the proper trunk development of the plant. In rare circumstances (sandy soil, tall evergreen trees, extreme wind, etc.) where the tree needs to be staked for a while, connect the guy wires as low on the trunk as possible and remove the stakes as soon as possible. Never leave them on more than one growing season. If staking has to be used for a short time, this is a pretty good system. It is loosely draped and allows the tree to move some with the wind. If the mulch was removed from the flare, this would not be a bad job of planting. 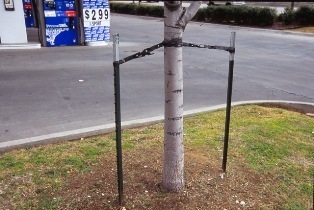 Temporary staking should be done with flexible guying systems that allow the trunk to have some movement with the wind. 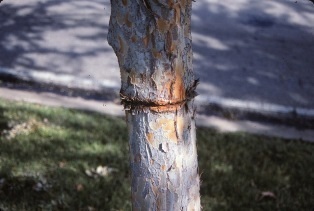 Staking should only be done as a last resort - it is unsightly, expensive, adds to mowing and trimming costs, and restricts the tree's ability to move and develop tensile strength and trunk diameter. It can also cause damage to the cambium layer, even if soft materials are used. Palms and other tall whippy trees are the exception to this rule. They usually do have to be staked for a while. Starting with smaller specimens usually avoids this issue. Damage caused by staking. Improper staking. Trunks of newly planted trees should not be wrapped - ever. It is a waste of money, looks unattractive, harbors insects and leaves the bark weak when removed. Tree wrapping creates damage similar to when a bandage is left on your finger too long. 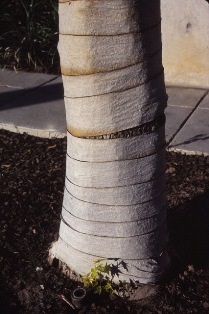 If you are worried about the unlikely possibility of sunburn, it is much better to paint the trunk with a diluted latex paint that matches the color of the bark. White is OK too. If tree trunk protection is needed against sunscald on thin barked trees, such as ash, birch, linden or maple, white washing trunks is much better than trunk wrap. White latex paint that is diluted with water to about a 50 – 50 mix works well. Doing this same process with paint about the color of the trunk is even better. This ARS tested and approved method is effective at repelling insect pests as well as preventing sunburn. Landscape contractors have admitted to me that brown paper wrap, tree stakes and guy wires and even the troublesome watering rings are added to newly planted trees for no other reason than to impress the homeowner. this will prevent borer insects. There must be some pretty stupid insects out there! It is very bad advice to prune at planting to compensate for the loss of roots during transplanting or planting. Most trees fare much better if all the limbs and foliage are left intact. The more foliage, the more food can be produced to build the root system. Even low limbs and foliage should be left on the tree for at least two growing seasons to aid root development. The health of the root system is the key to the overall health of the tree. The only trees that seem to respond positively to thinning at the time of transplanting are field-collected live oak, yaupon holly and a few other evergreens. Plants purchased in containers definitely need no pruning, and deciduous trees never need to be thinned. Bare root trees need no pruning. Thinning out the top of transplants and new trees is another old time procedure that doesn’t make sense. Alleged experts still recommend cutting away as much as 50% of the top growth to compensate for root loss. I’ve planted lots of trees, including fruit trees, and they always establish and start to grow better when all of the limbs are left on the tree. Dr. Carl Whitcomb has proven this with his plant research. Trees need foliage to collect sunlight, manufacture food and grow. There are two exceptions in Texas – live oaks and yaupons transplanted from the wild. They do respond positively to a thinning of about 40% of the top. Why? Don’t know, haven’t figured it out yet. It could be the reduction in weight, wind resistance, and allowing more sunlight to the remaining leaves. Some say that transplants have a large loss of fine and small feeder roots from being dug up, and loss of fungal colonization of the root hairs that were also left behind. This greatly reduces a plants ability to absorb nutrients and water required. Hence a reduction of top growth reduces demands on the root system. Most tree people disagree with this and have completely stopped thinning out and cutting back trees. Some arborists have been discussing the problems with both balled and burlapped and more so with container grown trees and they are leaning strongly toward recommending bare rooting techniques again.